With 13 kids to entertain, a sunny summer afternoon, and a handy picnic table, it was time for candy experiments! As always, testing for acid was a huge hit, especially when we tried Warheads, Nerds, and Lemonheads (remember to let Lemonheads dissolve for a few minutes before adding soda). We also competed to see who could shape taffy into boats that would float. Most boats sank quickly, but a few winners stayed up for several seconds. An 8-year-old girl was our champion, stretching several boats of Tootsie Roll (one of her secrets was to use at least two pieces), and a 5-year-old girl won for the longest time with a taffy boat. To make a taffy boat, mold your taffy into a bowl shape, and be sure not to poke holes in the bottom. Diverting kids with a few bottles of bubble solution might have been be cheaper, cleaner, and a lot less work. But the kids had a great time (some played with candy for over an hour and a half! 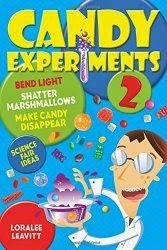 ), and learned some science, and the candy experiments sure added a splash of color to an otherwise low-key afternoon.